"They take time to explain and answers questions. Per my request Kelly brought all the materials to my home to see, feel, touch and tells all the pros & cons of the materials Kelly answered all my daughters questions & concerns and accommodated their request. All my concerns about my skylight - answered, courteously by one roofer Daryl showed me proof that I was getting Trimline shingles and not Heritage shingles as ordered. My friends said my roof looks nice!!" "Everything went great--from making the appointment to them coming out and fixing the problem. I was pleasantly surprised when they were able to determine the problem and fix it on the spot. Shout out to Daryl who was the first who actually got out a ladder and climbed up on the roof to inspect it! All 3 other companies I had out for an estimate never did, and all three of them recommended new roofs costing thousands of dollars! Turns out it was a minor problem. I am happy to report that it has since rained and there was no more leaking! I am very happy with the work they did. I would absolutely hire them again and will highly recommend them to all my neighbors and friends." "It was definitely awesome. I would definitely recommend them. They came out for a free estimate because we had a lot of storm damage in our area because of ice storms and stuff. So they got to us as soon as possible, which was probably about a week and a half. But we didn't have a leaking roof, it was a hole into out attic, so we weren't first priority. But they were awesome. When they came out it was done in one day. He realized that he had the wrong size wood to repair it and he let us know that he had to just leave and go get the correct size and he would be back.It was awesome all the way around." "The roofers did a fast, professional job and cleaned up after themselves. They were also careful not to damage any plants along the sides of the building. I can recommend these guys." "Great! From start to finish." "I wanted to congratulate you on the wonderful job you did on our roof. The look of the finished product is great. What I Liked was how friendly, competent and responsible your team was in getting the job done. They cleaned up each day without destroying any plants or shrubs. All stuff was put away at the end of the day. 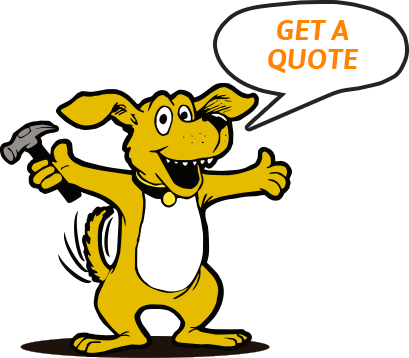 Your quote was what we paid and you took the time to explain what was needed and why. I have no reservations about recommending you to anyone, Have them call me!" "Repaired pockets of roof that needed attention. They did well!" "Terrible wind storm a month ago tore off 4 shingles. Ben from Good's Roofing said his crew could replace the shingles for the minimum charge for roof repairs. Little difference between new and old shingles. Devon and Rich did a fantastic job. They were very polite an also fixed a drip shield that was loose." "They offer free 17 point roof and attic inspection. Found everything in good condition. The house is 32 yrs old and shingles 18 yrs old. They did not try to find something to fix. Showed me pictures of critical area of the roof. The inspection also included attic which was found to be in good condition. I was pleased that they didn't use the free inspection offer to generate immediate repair business. They would be definitely at the top of my list whenever I need to have repairs or install new roof shingles." "Each gutter was 65 feet long and after 9 months they are still up and not leaking. Goods was able to match the color off the down spouts and trim so we didn't have to repaint anything to match.The two installers were competent and friendly. Usually gutters as long as ours required more people to get up but they managed to get them up with just two people due to their skill and the low winds.The only minor complaint we had with the installation was the office secretary normally calls the day before installers come. An unexpected emergency had the secretary out of the office on Friday 105 so we were unaware of the installation on Saturday untill we suddenly awoke at 8 am to 130 feet of gutters being knocked off the house. Once we determined that they weren't scrap metal scavengers things went well." "Thank you to you and your crew, they did a great job roofing my home. You and your crew were professional, courteous and had a general concern for my satisfaction that far exceeded my expectations. I appreciated the clean up that was done at the end of each day. It just reinforced that fact that Good's Roofing wanted me to be happy! I also appreciated the 2 young men that returned after the job was completed to install my lamppost. You can be sure that Rick and I will recommend Good's Roofing to everyone we know." "Thank you Kelly! For helping us out truly grateful!!" "This company has the best workers, they know how to do the roof right without compromising on product or labor! They do prompt work, clean up nice afterward and are always kind and courteous, I would gladly recommend them to my friends and family!! No sub contracting but employees who are proud to put their name on their work and stand behind the job!" "The roofing project for my house was a massive job based on the numerous repairs required. I am so glad I contracted Good's Roofing for this job for the following reasons:My initial contact with Good's Roofing was with their Sales Representative, Ben Sprague. Ben was very professional and answered any questions I had about the project. Ben provided his e-mail address. cell phone number, and always provided an expedited answer to any inquiries. I also appreciated the quoting format that made selecting the roofing package I wanted an easier process. (I wanted 6 foot ice guards, synthetic underlayment, and HD shingles), When I contacted their main office, I was always put in touch with a person (not a recording). All appointments and worked scheduled were completed at the promised time.In all phases of construction: chimney repair, roof, and gutters; the installation crews were expert craftsmen and did a quality job on installation and cleanup. Their staff is very knowledgeable about their products and can make recommendations (i.e. ; gutter water flow) Devon Hall, General Foreman for Good's Roofing; continuously inspected the in process work to insure everything was to Good's Roofing high quality standards. He also did a final inspection of the completed project. Again, his cell phone number was provided if I had any questions. Good's Roofing did a superior job in all the coordination with their crews to complete the project. In addition, they have a very thorough warranty on their work. In summary, Good's Roofing is an excellent company in quality, service and price." "You were not the lowest estimate, but I had a gut feeling that your company would not cut corners or mislead me, so I went you. I made the right choice, Daryl is top notch!!!" "Did an excellent job with everything. The estimate, the explanation of the work, the installation and clean up after all the work was done." "Completed work in a timely matter (quicker than I expected) and resolved any issues within 24 hours." "Roofing guys were great. Kelly and Michelle were very helpful." "Conduct them selves honestly and professionally. The quality of the work was very impressive."